Running out of ideas ... and time? Give your friends, family - and yourself - gifts that make life easier and more fun! 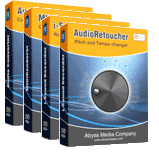 i-Sound Recorder, AudioRetoucher, Audio Converter Plus and MIDIRenderer at great price! Full-featured streaming audio recording software with built-in scheduler, splitter and voice activation. AudioRetoucher is an music transposition tool that changes the pitch and tempo of an audio composition. MIDIRenderer is a MIDI rendering software that allows you to convert MIDI to WAV, MP3 and other popular audio formats. Abyssmedia Audio Converter Plus is a powerful, professional solution designed for converting the most popular audio formats.